"Why do you think there are time zones? Why do you think taxes and prices go up the same day in the ghetto? The cost of living keeps rising to make sure people keep dying. How else could there be men with a million years while most live day-to-day? But the truth is... there's more than enough. No one has to die before their time." - Henry Hamilton (Matthew Bomer) reveals the truth In Time (2011). Writer/director Andrew Niccol gave the modern science fiction cinema one of its finest and most heartfelt dystopian films in 1997's Gattaca. By envisioning a world wherein genetics determined destiny and wealth, Niccol offered a unique social critique, one primarily concerning racism and class society. Niccol's latest sci-fi vision, In Time (2011) shares some of Gattaca's ambitious qualities, but it stresses action and high-concept sci-fi rather than moving character development. Where Gattaca was endlessly inspiring, In Time (2011) is fast-moving. Where Gattaca was a deep character piece, exquisitely performed by Ethan Hawke and Jude Law, In Time plays more like a sci-fi variation on Bonnie & Clyde (1967). Specifically, the famous line "we rob banks" from that Arthur Penn classic appears to be the impetus for In Time's second half, in which two rebels "steal time" from the rich and give it to the poor. In Time's saving grace, however, is the central premise, a sci-fi "high concept," which is so blazingly of the moment, and so incredibly relevant to the national discourse, that it imbues the film with zeal, energy and purpose. In short, the film literalizes the adage "time is money," as the quest to procure more time (centuries, years, months, days, hour, minutes, seconds...) becomes the driving economic force in this future America. The film focuses on one rebel, Will Salas (Justin Timberlake), as he begins to recognize, after a personal tragedy involving his mother, how flawed the system is, and how terrible life has become. Unfortunately, the economic system of In Time is actually a stacked deck, Will soon learns. The corporate-controlled future envisioned by In Time thrives explicitly on "Darwinian capitalism," which sounds a lot like Mitt Romney's business ethos of "creative destruction." To become richer and live longer, the wealthy must constantly squeeze the poor in a vise. No middle class survives, or is depicted in the film. It's long gone, I assume. Every day in In Time's world, the rich manipulate the cost of living in the cordoned off "zones," ensuring that average people must work harder and faster to earn the same amount of time. Every day, the price of food, gas, and other necessities rises so that the poor can't pause to think about the inherent unfairness of the system or even travel to a better place, if there is one. Instead, they must worry about the time clocks on their arms as simple survival becomes the most critical task each day. Preserving this system are Time Keepers, law enforcement officials who report to the rich, and who make certain that even if a poor person hits the jackpot in terms of extra time, he or she doesn't get to keep that wealth. Rather, riches in this world are safely and perpetually ensconced in the hands of the few and powerful. One corporate executive who runs a time bank, Weis (Vincent Kartheiser), has a million years of life stashed in his vault for a rainy day. He doesn't use it. He doesn't touch it. He just keeps it. It trickles not down, but nowhere. Meanwhile, average folk die young every day, unable to make more time for themselves. It's pretty clear how In Time plays into the Zeitgeist of right now. Americans are becoming aware that our own economic system -- which once encouraged hard work -- has gone wrong. A cabal of "vulture capitalists" (a term coined by conservative Rick Perry) control the resources while the masses suffer foreclosure, economic hardship, and lose the social safety net that was erected over a century of hard work to protect them from just such robber-baronism. There's no doubt that the Occupy Wall Street movement is part of this film's sub-text, and increasingly becoming the sub-text of many high-profile entertainments, finally replacing the tired if ubiquitous "post-9/11" Hollywood paradigm. It's also rather amazing how much In Time parallels the narrative and context of Bonnie & Clyde. That landmark film also involved robbers who were bucking an unfair economic system. There, banks after the Great Depression were foreclosing on family farms left and right, and leaving Americans with absolutely nothing. Bonnie & Clyde didn't rob from the people, though. Instead, they took from the banks on the theory that you can't steal what's already, in effect, been stolen. In Time adopts that very formulation, terrorizing an establishment that has used its power to unfairly take from others. But In Time goes further than Bonnie & Clyde ever did in one sense. It actively suggests widespread revolt. Very soon in In Time, a revolutionary thought dawns on the wrongfully exploited folks. The truth is, one character admits, that there is more than enough time (wealth) to go around for everybody. Nobody needs to die before their time. Therefore, it's time (wealth) re-distribution time. And that's the (communist? socialist? just?) task the film's outlaws, Will and Sylvia Weis (Amanda Seyfried) undertake...with guns a-blazing. They aren't making time for themselves...they're giving it away (and again, like Bonnie and Clyde), becoming folk heroes in the process. In real life, the 1% should probably be concerned about this eventuality at least a little because many people, in both political parties, are waking up to the inherent unfairness of the game too, and In Time certainly brings these submerged thoughts to the surface. How Super-Pacs buy our candidates. How corporate crimes go unpunished. How wealth doesn't trickle down, but gets sucked upward (like cocaine in the nostrils...) in terms of outrageous executive bonuses and salaries, sometimes hundreds of times higher than those of employees who actually, you know, do the work of a business and produce the goods. Aside from Bonnie & Clyde, I was also reminded very much of Fritz Lang's landmark sci-fi epic Metropolis (1927) while screening In Time. That silent film also showcased a revolution among the have-nots against the haves. There, however, the film advocated a peaceable "mediator" between the hands of society (the workers) and the so-called brains of society (the bosses). That mediator, importantly, was the human heart. And heart is what is absolutely is missing from the creative destructors of today's out-of-whack Darwinian capitalism. They don't want us to have access to health care. They don't want us to keep pensions. They don't want us to organize, so we can effectively defend ourselves against corporate greed. They don't want any regulations to prevent them from making obscene amounts of money, at the expense of the environment and our health. Why, they don't even want us to have contraception so we can manage the size and shape of our own households (and therefore our economic future). In short, they want us to be nothing but life-long debt slaves, so we can continue to make them money that they will then keep locked in their vaults, out of circulation, except for their needs. This is the dynamic In Time contends with: a world where there is no compassion -- no heart -- and where obscene wealth is the highest aspiration in life. 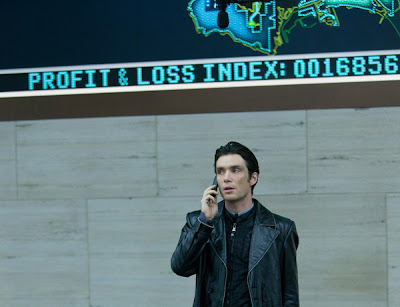 Given America today, In Time plays brilliantly and brashly into the populist spirit of 2012, and the film's central metaphor -- time is money -- works so well because it exposes something trenchant about our human existence. In the film, when you don't get currency (again, time), you die right on the spot. This fact is clouded in real life, because we don't literally have a constant balance on our arm ticking down to zero. Instead, we get niggled with a hundred different debits a day, and don't see the forest for the trees. If we can't afford health care, we will die. If we can't get a job and provide for our family, we will die. If we can't buy food, we will die. In Time cuts out the middle man, as it were, and bluntly proposes the notion that by absorbing resources from all of us, the super rich are actually killing us, a little bit at a time. Certainly, they're killing the middle class. If this is class warfare, so be it. We aren't the ones who started it. However, as much as I find the central metaphor of In Time meaningful and brilliantly executed, I must confess, I don't think the film works as well as Gattaca did. Both films depict an unfair system, and ways to get it around it, but Gattaca really made us feel for Hawke's character and his plight. Justin Timberlake is fine in In Time. He's not a bad actor, judging by his work here and in The Social Network. But he is not yet able to convey the depth of his grief, sadness, anger and fear very well. At least not so well as Hawke did. There's something more superficial about Timberlake's character here -- something more conventional -- and so In Time works more fully as a great concept than as an affecting human drama. Bonnie & Clyde featured action and yet it was also a character piece. The characters here just don't compare in terms of complexity and humanity. At times, they feel like props instead of real personalities. Also, by focusing so strongly on action, In Time tries to ramp up suspense with cliffhanger-type scenarios wherein people are running out of time...to the last second, and need more time NOW, or will die instantaneously. These moments are played right to the edge of sanity, and ultimately feel kind of absurd and cheap. When you've devised such a great and timely science fiction metaphor, it seems a waste of time, if you will, to focus on car chases, shoot-outs and on-foot pursuits. The film also doesn't really effectively get at another interesting point. And that is that everyone in the film stops aging at twenty-five. In short, this means your grand mom is hot. This means your son looks like your brother. It's a complete, absolute unwriting of all the social cues that arise from the aging process. You could go to bed with a hot 95 year old, or a 105 year old, and not know it. In Time doesn't really explore the issue of what this all means: the breaking down of traditional human social organization. The film's ending also feels wrong to me on a gut level, because the corrupt system is overturned with relative ease, with only the hard push of two armed (if admittedly well-placed) rebels. I'm happy the corrupt system is overturned, but I don't believe it could be so easily destroyed. Change isn't about a person, it's about a long, difficult process, right? Dystopian films made in the 1960s and 1970s didn't feel compelled to universally provide happy endings (THX-1138, Z.P.G., etc. ), yet today, it seems the happy crappy Hollywood ending is pro forma. Gattaca ended on an upbeat note, but at least the system was not overturned. Recent dystopic movies such as Gamer, Surrogate and now In Time reveal "heroes" beating authoritarian regimes with just a few rebellious moves. Frankly, I don't believe it would be so easy. 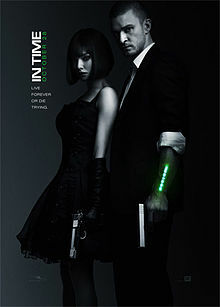 In Time is brimming with great, timely ideas and loads of intelligence, but I feel that overall the film should have been bleaker and perhaps even angrier. The Bonnie & Clyde model was there to follow, and it should have been pursued more aggressively, perhaps, in the final act. Weis should have put the fix in for his wayward daughter, Sylvia, and for Will, and gunned down the heroes in a blaze of glory. That feels "truer" to me. In Time certainly doesn't waste your "time," but I'm not certain it actually makes the most of its time, either. I have this one in my Netflix queue. Fine review, John.